In our Family Adventure Cambodia Tour you will experience authentic Cambodia, get in touch with the local culture through enjoyable and educational activities of Banteay Chhmar Community Based Tourism. The whole family can spend time together: ride through surrounding countryside, visit rural villages and explore wonderful ancient temples of Angkor Archaeological Park. With a careful balancing of included activities and free time, this is a trip perfectly crafted to the whole family. Welcome to Siem Reap City, the provincial capital and gateway the famed Temples of Angkor. 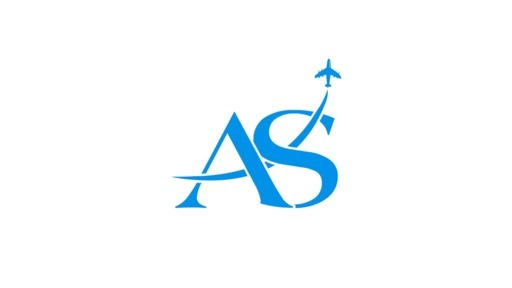 Upon arrival in Siem Reap International Airport, you will be greeted by your Cambodia travel tour guide and transferred to the hotel for check in and refreshment. After some relaxation, we will take visit to the famous Angkor Wat by “remork’’ (Cambodia tuk tuk). Angkor Wat was built in the early 12th century by the Khmer King Suryavarman II and was originally constructed as a Hindu temple to dedicate to god Vishnu. It was constructed following the model of the temple mountain symbolizing the Mount Meru, home of the gods. At the end of the 12th century, it was transformed into a Buddhist temple. Inside the temple, we will see the walls are covered with stone carvings and bas-reliefs depicting Hindu mythology, the wars Suryavarman II fought during his reign and more than 2000 images of Apsaras and Devatas decorating the temple. In the late afternoon, we will take a visit to Phnom Bakheng, a Hindu and Buddhist temple in the form of a temple mountain which is dedicated to Shiva. Phnom Bakheng is also well known as one of best place to watch sunset in Angkor Wat complex. Enjoy the panoramic view of surrounding countryside and the beautiful sunset over the forest. We depart Siem Reap town and begin our first bicycle ride (2 – 3 hours) through lush green rice paddies and beautiful villages. The road condition is good and easy to ride. Our support vehicle will be on hand to take the strain in case you or your children find the going gets tough. Along the way, we would stop for refreshing breaks and a few chats with the locals. 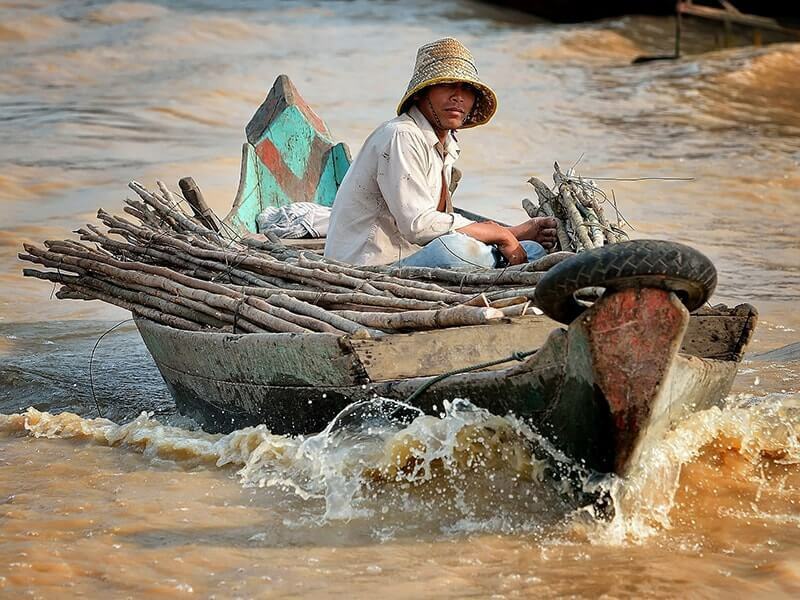 Continue to the Tonle Sap Lake, the largest permanent fresh-water lake in Southeast Asia. Embark on a two-hour boat tour on the giant lake where you visit the floating village of Kampong Phluk and have the opportunity to learn about local life. You also see a fishermen's "floating village" with floating schools, police stations, etc. Depend on water levels and current, this floating village moves from place to place. During your visit, your boat will take you through mangrove forests, a unique ecosystem that survives on flooded soil for months. Your guide is pleased to answer any questions about flora and fauna and kind of birds in this forest. 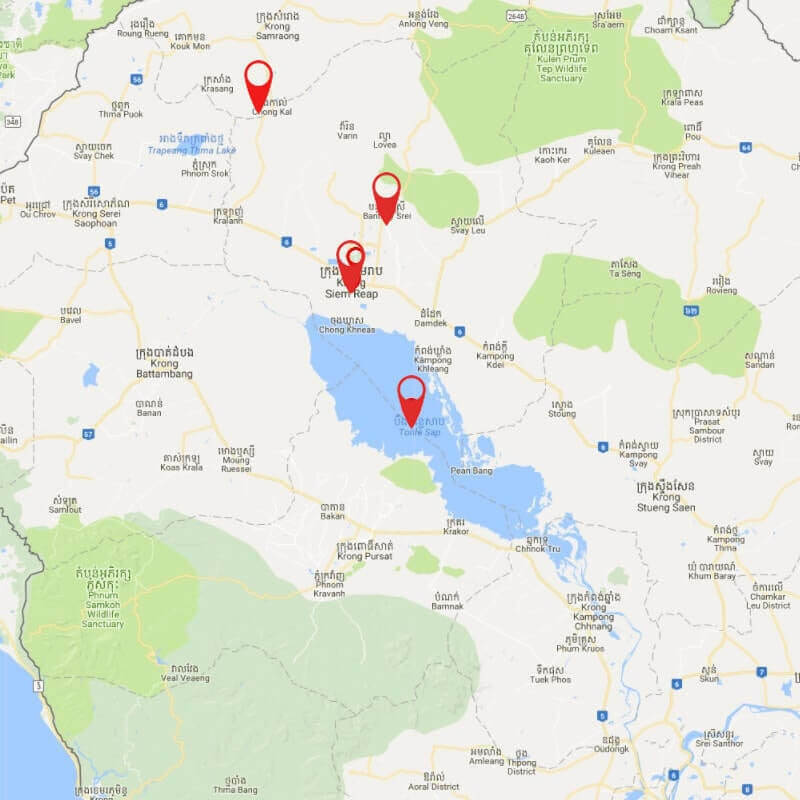 *** Note: At the end of dry season, (around late March to June) the water level may not be suitable for the boat trip. 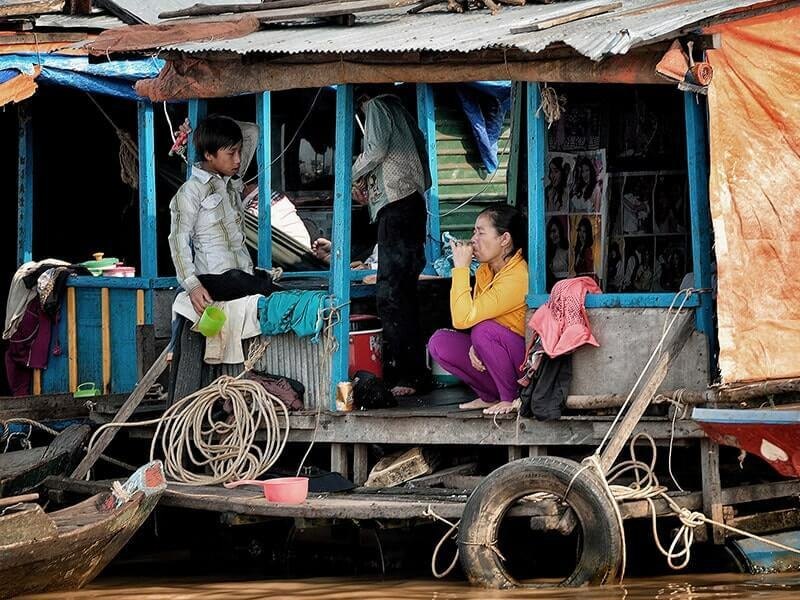 An alternative floating village at Chong Kneas can be arranged instead. Enjoy your picnic lunch on one of the local houses before riding back to Siem Reap. This morning, your guide and driver will provide you with a transfer to Banteay Chhmar (165 km) which takes approximately four and half hours. En route, stop at some local markets and villages to observe daily activities and interact with the locals. Arrive in Banteay Chhmar in the noontime, have lunch at the community center. 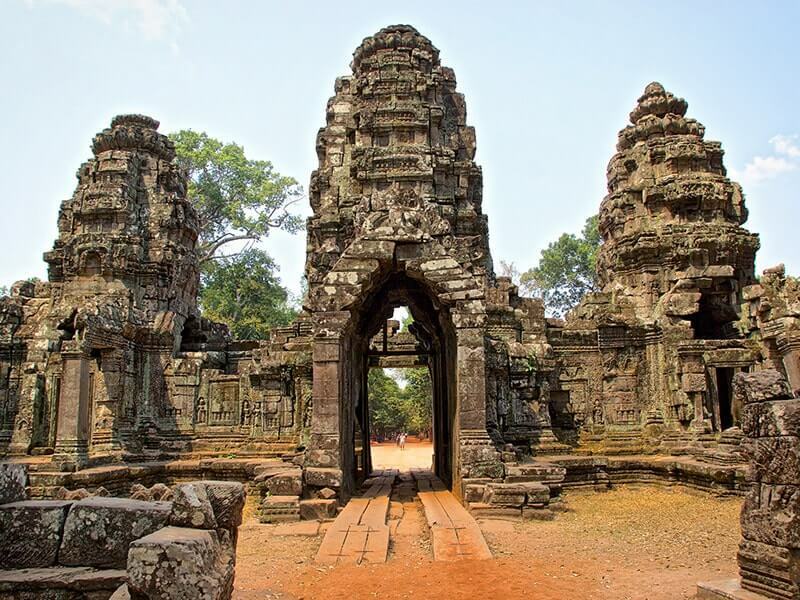 Banteay Chhmar is a community based tourism (CBT) in the same name archaeological park. Banteay Chhmar is one of the largest Khmer complexes built outside of Angkor. 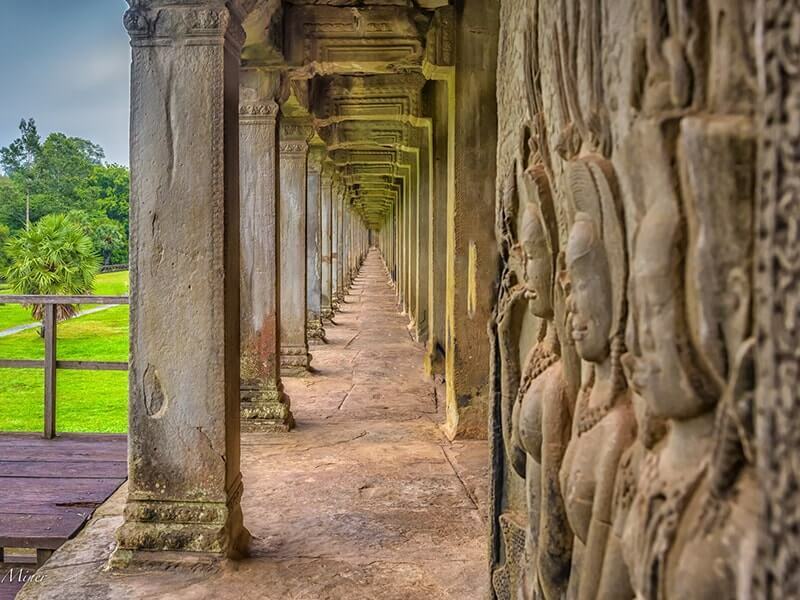 It was constructed by the famous Khmer warrior king Jayavarman VII in honor of five heroes, including his son, who died defending the Khmer Empire against the Champa Kingdom. 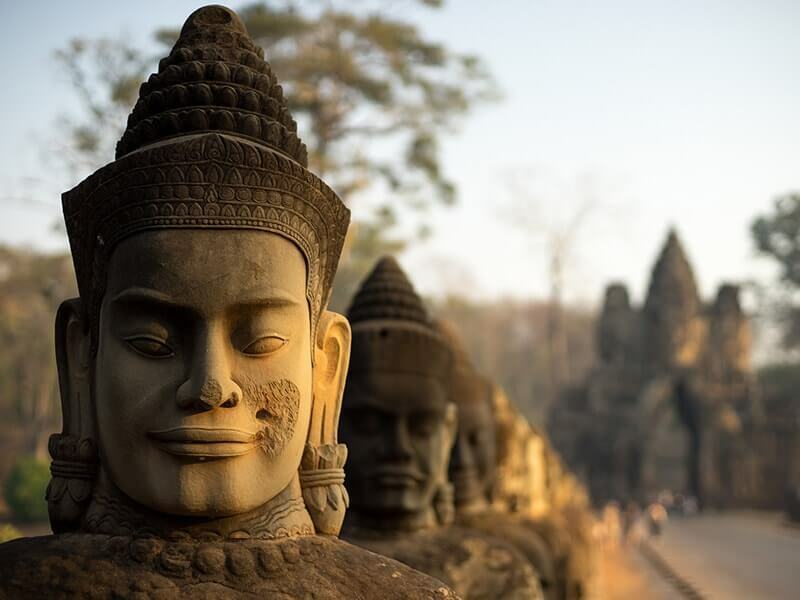 The site is renowned for its Bayon styled towers, beautiful carvings which depict the war between the Khmer and Champa Kingdoms. After the visit to temples of Banteay Chhmar Archaeological Site, take an ox-cart or kuyon (hand operated tractor) to the top of the Banteay Temple to see the sunset. It is a fun way to travel Khmer style amongst some lovely scenery! In the early evening, enjoy a simple but delicious dinner with your host family. 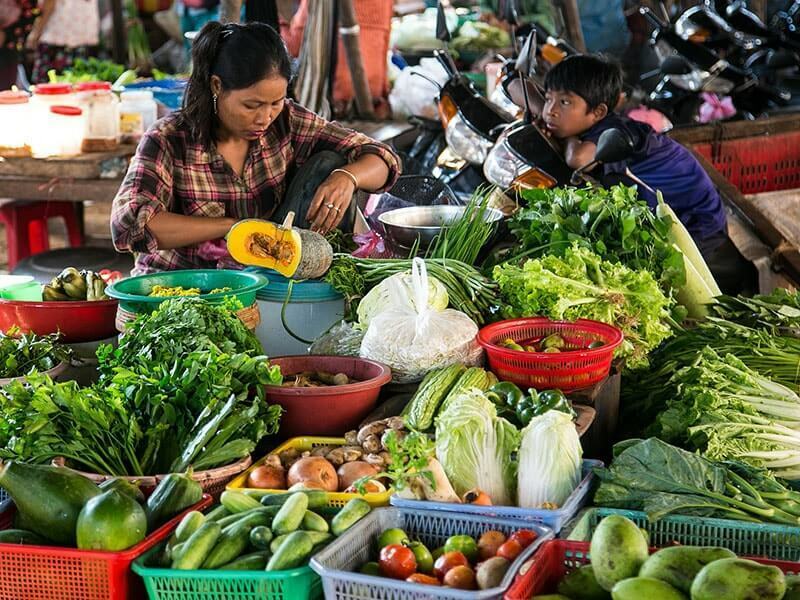 After breakfast at your homestay, we will visit the local morning market in Banteay Chhmar to get a great insight into daily life of local. Take an ox-cart tour around to discover the Banteay Chhmar and learn about the way of life in rural Cambodia then have the chance to meet and chat with the wonderful and friendly people. Visit the a silk center, rice fields, and stop at farms along the way. 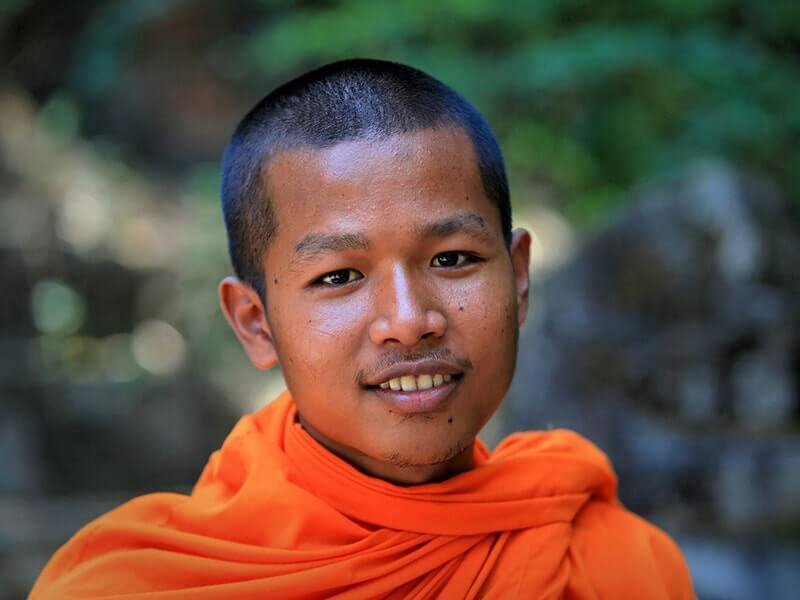 Your guide is very pleased to explain about some of the traditional life that takes place, including fishing, beekeeping, weaving and rice farming. Enjoy your picnic lunch before heading back to Siem Reap. Upon arrival in Siem Reap, you will be free at leisure. 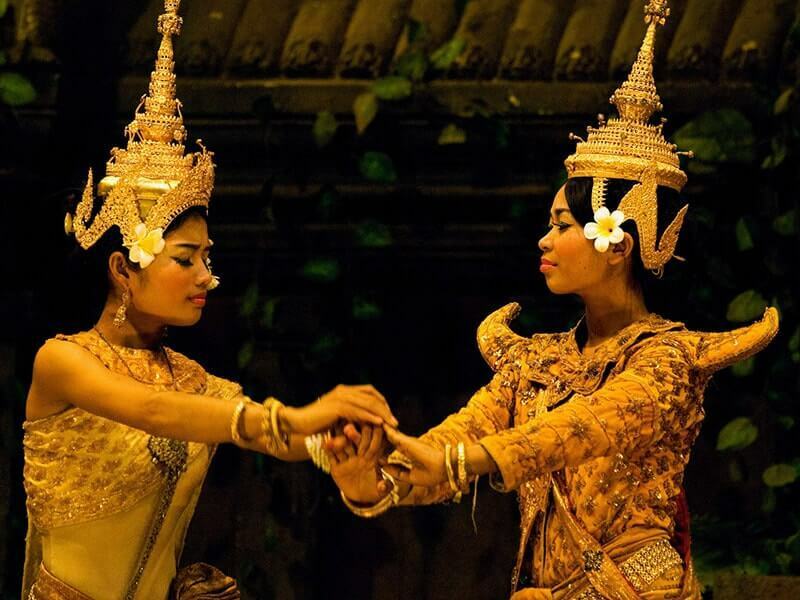 Optional: In the evening, you can enjoy the remarkable Phare, the Cambodian circus show. It is a NGO project which teaches disadvantaged children and teenagers living on the streets how to become circus artists. Enjoy music, acting, acrobatics and high-energy music in this show. 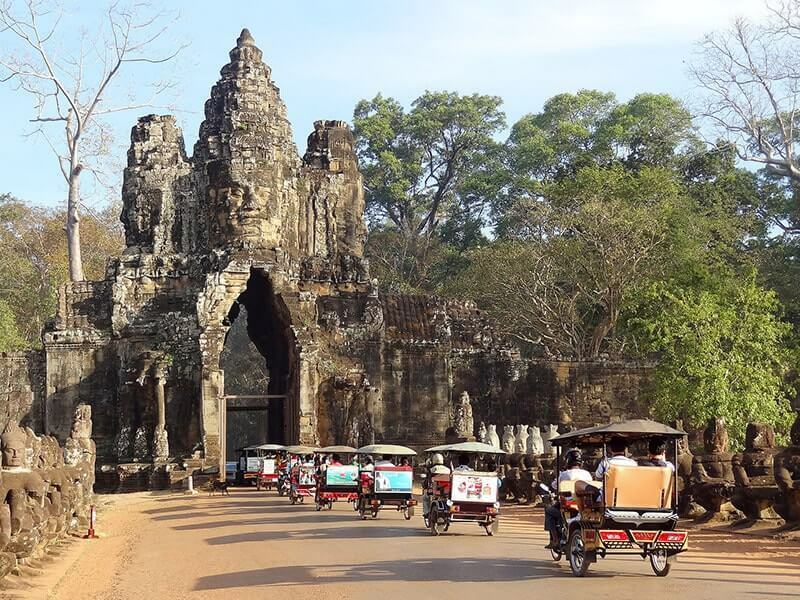 This morning, we make another bicycle ride to Angkor Complex and take a visit to the ancient city of Angkor Thom, the last capital and most enduring of the Great Khmer Empire under the reign of Jayavarman VII. Pass through the imposing South Gate, an impressive stone gate carved with elephants and four giant faces. Our first destination is the inspirational Bayon Temple which locates at the heart of Angkor Thom. This 12th century is well known for its impressive giant faces carvings and wonderful wall carvings telling the story of historical battles. Then we continue visiting the Elephant Terrace and the Terrace of the Leper King. It would be great experience to keep walking through the maze and observing their wonderful, fabulous, intricate sculptures. From Angkor Thom, we proceed to jungle-entwined Temple of Ta Prohm, built about late 12th century to early 13th century by the King Jayavarman VII. After that, we head back to the town for lunch and refreshment. In the afternoon, you will be driven to the “jewel of Khmer art” the beautiful temple of Banteay Srei which is 25 km north-east of the Angkor main group temples. It was built in 967 AD and is a temple dedicated to the Hindu god Shiva. Banteay Srei means “Citadel of the Women”, it is the finest examples of classical Khmer art with wonderfully well preserved wall carvings and towers which are decorated with male and female divinities and beautiful filigree relief work. En route, we will stop at an exotic butterfly sanctuary and Preak Dak Village to interact with the villagers and learn about their way of life. This village also famous for its handmade souvenirs which are made of bamboo and rattan. The Family Angkor Adventure Tour wraps up today. Free at leisure to relax at the hotel or to discover Siem Reap Town on your own until your driver transfers you back to Siem Reap Airport for your onward flight. Bicycles for Siem Reap touring days. Boat in Tonle Sap Lake (Siem Reap).